As many of you have been asking us a lot about what the tax overhaul means for businesses, we are giving you the rundown on the corporate side of 2018 tax changes. There are quite a few changes on the corporate side, and a good number of these apply to larger businesses. Here is a summary of the impact the tax reform will have on small businesses. If you own a pass-through entity such as S Corp, LLC, Partnership or Sole Proprietorship, you can deduct 20% of your pass-through income as a credit on your personal tax return. To receive the full 20% credit your total income (W-2 wages + pass-through business income) must be under $315,000 per year if filing as married/jointly, or $157,500 if filing as single. If you are over that income threshold, the credit calculation becomes more complicated and may be limited to less than the 20%. So, how does it work? Here is an example. Let us say Small Business X nets $124,293.80 after expenses this year. Under the new tax law, Small Business X is allowed to take 20% of that number right off the top. That is quite a saving! While this does not necessarily affect many small businesses directly, the move from a top corporate tax rate of 35% down to 21% is absolutely massive which is resulting in a large number of jobs being created and more money in the pockets of workers. Each year businesses are allowed to use Section 179 depreciation to deduct 100% of the cost of equipment and other assets placed in service in that tax year. For 2018, the total amount of assets that can be deducted under Section 179 is $1,000,000. 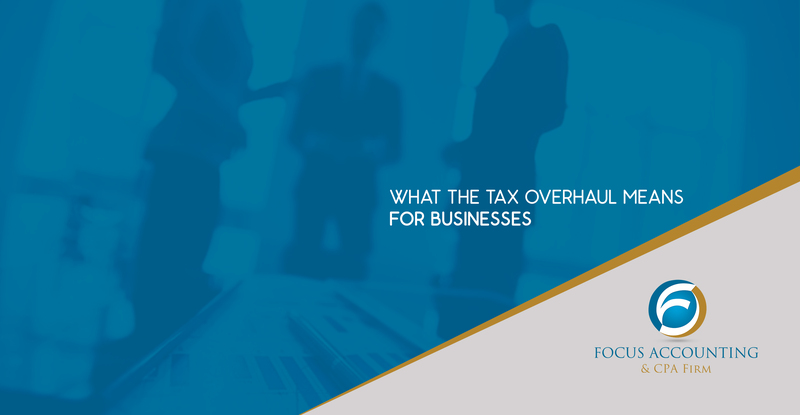 All businesses that have an average revenue under $25 million for the preceding three years, can now file taxes under the cash basis of accounting. This even applies to those businesses that maintain inventory, that previously had to file under the accrual method. This is HUGE for those businesses. Bonus depreciation is back. Businesses can deduct 100% of property placed in service after September 28, 2017 – even used property. Bonus depreciation can be used even if the business was previously showing a loss, which is not allowed under Section 179. Allowable depreciation on luxury cars has been increased. The useful life of farm machinery & equipment for depreciation purposes has been reduced from 7 years to 5 years. A 15-year write-off period has been created for qualified improvement property placed in service after 2017. This is related to nonstructural improvement to business real estate property. Net operating losses can no longer be carried back 2 years. They will now only carry forward. A credit will be added to the general business credits for employers who have a written family medical leave policy and who pay their employees at least 50% of their wages while on leave as long as the employee has worked for more than one year and earned no more than $72,000 annually. Previously, business meals and entertainment were 50% deductible to a business. Any deduction for business entertainment paid for after 2017 is denied. The meals are still deductible at 50%; however, the deduction for business entertainment is no longer allowed. Client hunting/fishing trips, season tickets to sporting events, concert tickets would be a few examples of things you can no longer deduct as a business expense. Previously, if a business owner provided meals for their employees or hosted annual parties/events, those expenses could be deducted 100%. Now they are only deductible at 50%. If your business provided tangible rewards for your employees, such as an iPad as a safety bonus, or tickets to an event as a performance award, these items were considered to be fringe benefits and not taxable to the employee. The new reform states that the value of those items would now need to be included as part of the employee’s income. 4. Companies that pay for parking, transit, or transportation for their employees are no longer allowed to deduct those costs.